Arecibo is a municipality on the northern coast of Puerto Rico, on the shores of the Atlantic Ocean, located north of Utuado and Ciales; east of Hatillo; and west of Barceloneta and Florida. It is about 50 miles (80 km) west of San Juan, the capital city. 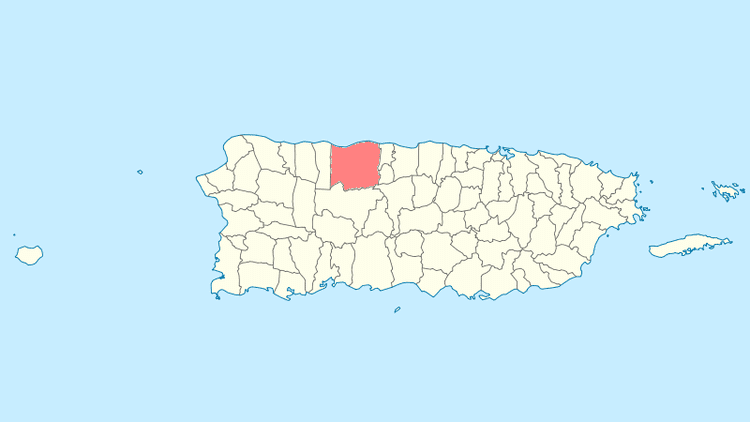 Arecibo is the largest municipality in Puerto Rico by area, and is part of the San Juan, Caguas and Guaynabo Metropolitan Statistical Area. It is spread over 18 wards and Arecibo Pueblo (the downtown area and the administrative center of the city). Its population in 2010 was 96,440. Arecibo is also known as La Villa del Capitan Correa (Captain Correas Villa) after the Puerto Rican hero Captain Antonio de los Reyes Correa of the Spanish Army, who drove off a British Navy invasion by ambushing forces led by rear-admiral William Whetstone. Arecibo is also known as El Diamante Del Norte (The Diamond of the North) and La Ribera del Arecibo (The shore of Arecibo). 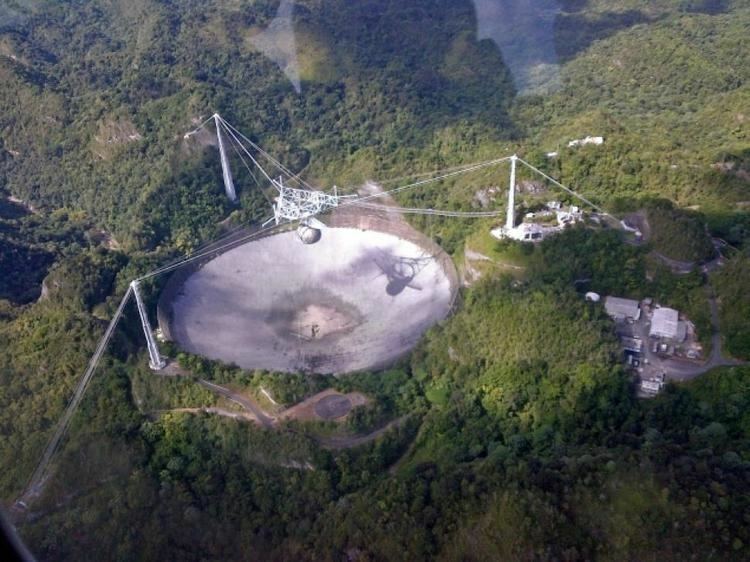 The Arecibo Observatory, known for housing the worlds largest radio telescope, is located here. Arecibo is the seat of the Roman Catholic Diocese of Arecibo. When the Spanish arrived, they found the area occupied by the indigenous Taino, led by Xamaica Arasibo, Cacique (chief) of the yucayeque (town) then named Abacoa. Spanish colonists settled Arecibo in 1556, which they named for the cacique. It was their third settlement on the island, after Caparra (which later became San Juan), and San German. It is named after the cacique. Arecibo was officially founded as a city by the Spanish crown on May 1, 1616, under the governorship of Captain Felipe de Beaumont y Navarra, when the King of Spain granted the land (and the Taino living there) to Lope Conchillos. This gave the city its nickname "La Villa del Capitan Correa". For some time the island was competed for by other European powers. On August 5, 1702, Captain Antonio de los Reyes Correa, a member of the Spanish Army, successfully defended Arecibo from a British Navy invasion led by rear-admiral William Whetstone. Commanding two British Navy ships and 40 men, Whetstone tried to take control of the city. Correa ambushed his forces, killing 22 British seamen and driving them off. The Spanish defenders suffered only one death and three wounded soldiers. In 1778, Arecibo, by royal decree, was awarded the "Villa" status, though it was not integrated as such until 1802. In 1850 it was awarded the "Muy Leal" (very loyal). Over time, large part of its territory became separate municipalities. These include Manati, Barceloneta, Florida, Utuado, Jayuya, Hatillo, Camuy, Quebradillas and Isabela. In 1982, it was promoted to city status, though it continued to be affectionately by its previous nickname. 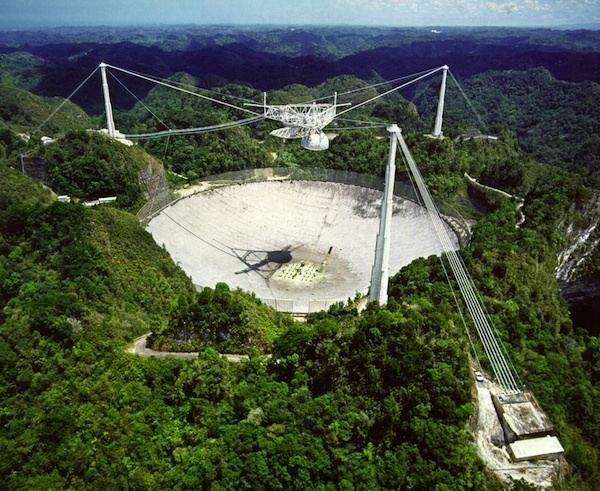 Arecibo is located in the Northern Coastal Plain region of Puerto Rico, extending inland into the Karst region. It lies south of the Atlantic Ocean; north of Utuado; east of Hatillo; and west of Barceloneta and Florida. The city occupies an area of 127 square miles (330 km2), of which, 45.23 sq mi (117.1 km2), is water. The Rio Grande de Arecibo is the main river in the municipality, running through the middle of it. 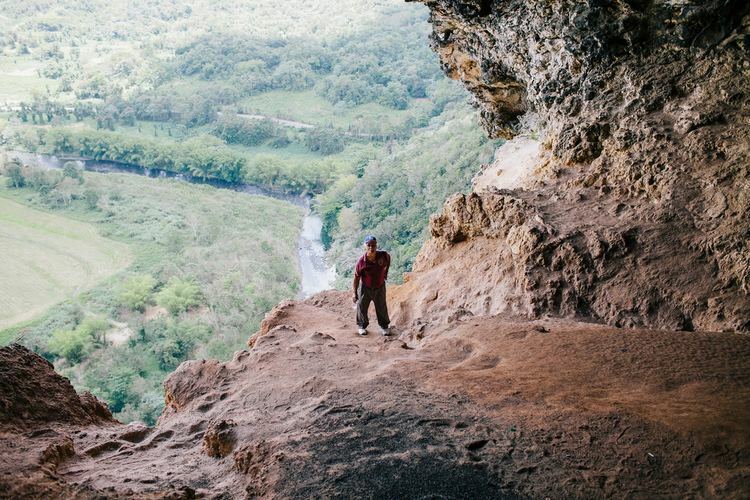 South of the municipality, in the karst region, it forms the Dos Bocas Lake, a primary source of water for Northern Puerto Rico. Several rivers feed the Rio Grande, including the Tanama River. East of the river, lies Cano Tiburones, an important marshland area that provides habitat for many kinds of birds and wildlife. Arecibo has two forest reserves. Cambalache State Forest is located along the Barceloneta city limits, while Rio Abajo State Forest is located between Arecibo and Utuado. 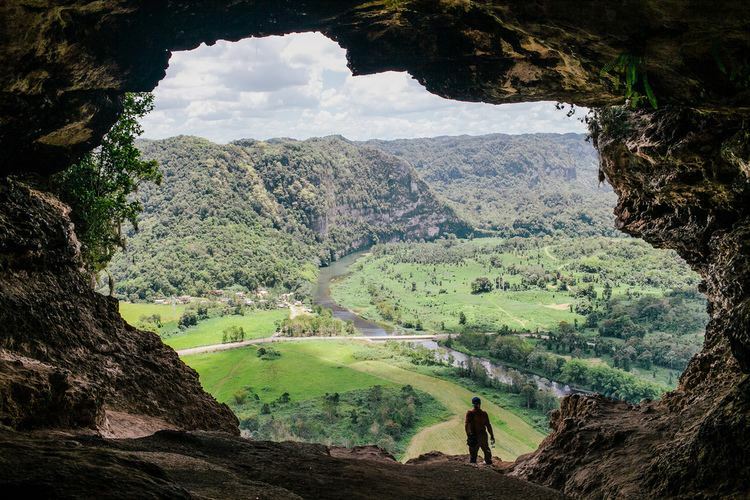 Caves include Cueva Ventana, which overlooks a valley formed by the Rio Grande de Arecibo, and La Cueva del Indio (Cave of the Indian), where paintings made by prehistoric indigenous peoples have been seen. Arecibo is one of the oldest colonial towns in Puerto Rico (1616). Among its historic buildings is the Cathedral of Saint Phillip Apostle, built beginning in the late 18th century. The first church, built in the middle of the 17th century, was destroyed by an earthquake in 1787. Construction of its replacement began soon after, although it was not completed until 1846. Four days after its dedication, an earthquake seriously damaged it. Repairs were not completed until 1882. The 1918 earthquake damaged the vault so badly that it was replaced by a flat concrete roof; a vaulted ceiling of composition board was placed inside. The cathedral of Arecibo is Puerto Ricos second-largest church after the Cathedral of San Juan. The plan is rectangular with three naves; the side naves are cut short to allow large flanking chapels, which occupy almost half the length of the church. The apse is semicircular, and has an unusual half-dome covering it. The facade is a triangular composition of three stages. The top stage, a short central tower, is a later addition, according to local architects and historians. Neoclassic ornamentation is used in an academic fashion on the lowest stage, but the other two show a less traditional use of bands and pilasters. The Renaissance-style windows are uncommon in Puerto Rican churches, but the central tower over the entrance is a common motif used throughout the island. The City Hall, built in 1866, served as jail to revolutionaries of El Grito de Lares in 1868. In the 1918 earthquake, the frontal section of the building was destroyed. When repairs were made, a tower and clock were added to the building. In 1978, the building was restored to its original form. The City Hall of Arecibo is typical of these regional seats of government. It is relatively modest in size, of stuccoed masonry, with an academically correct composition, having a pedimented center pavilion which projects slightly. The lower story is rusticated, with arched openings; the three doorways in the center giving the effect of a loggia. The upper windows all have segmental pediments and balconies; the central trio share one long balcony. Architectural detailing is modest, but the building is graceful and charming. In 1898 the Spaniards built the Arecibo Lighthouse. It was automated in 1964 and is still in use. A small park, Arecibo Lighthouse and Historical Park, has been established around it. 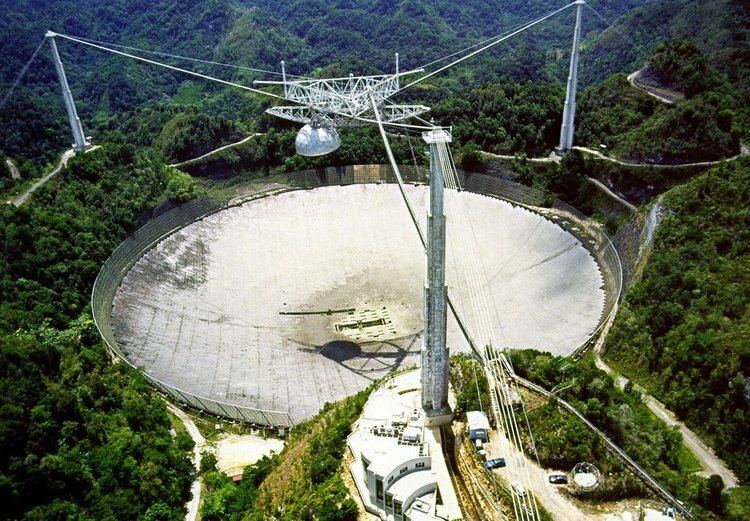 The Arecibo Observatory is the largest single-unit radio telescope ever constructed and one of the worlds most powerful radar-radio telescopes. The observatorys purpose is to support scientific studies. It has attracted several Hollywood directors who have filmed there; most recently GoldenEye and Contact. 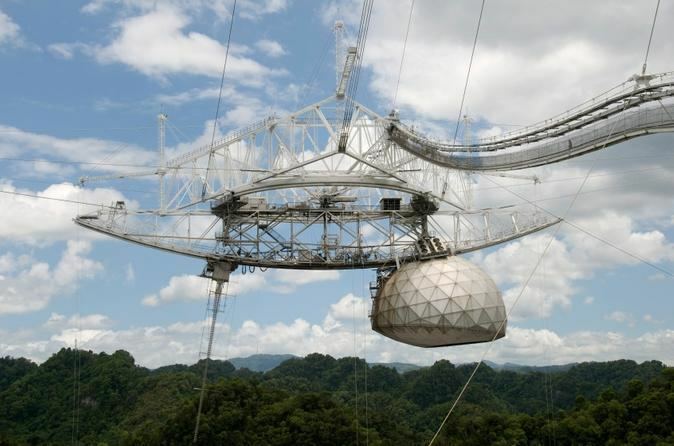 The radio telescope was used in 1974 to send the Arecibo message to space. Forest between Arecibo and Barceloneta. Originally a residence built by Spanish immigrant Francisco Ulanga, it has served multiple uses. It was later used as a bank, store, city hall of Arecibo, hospital, jail, tribunal, and is now operated as the Arecibo Cultural Center. Archeological site where Taino drawings can be found. Reservoir located between the municipalities of Arecibo and Utuado. Also known as Paseo de Damas or simply El Fuerte, it was built in 1881 where Fort San Miguels ruins once were. Home of the Arecibo Captains basketball team. 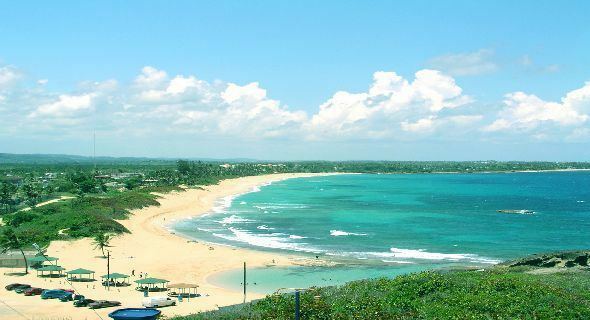 Nearby beaches include Los Morillos, Los Negritos, Poza del Obispo, and Las Tunas. Shows art from local artists and shows the citys history. Also nearby (18°29?N 66°26?W) is a facility for launching sounding rockets. Since 1966 many rockets of the Nike Apache, Nicke Javellin, Nicke Iroquois, Nike Tomahawk, Black Brant, Taurus Orion, and Terrier Orion types have been launched from this facility. Arecibo has two professional sports franchises, the Lobos de Arecibo in baseball and the Capitanes de Arecibo in BSN basketball. The Lobos won the 1983 national baseball championship and the 1983 Caribbean World Series, the only time the franchise won both titles. At that time, they had MLB prospect Dickie Thon, then also of the Houston Astros, on their roster. Thon then suffered a life-threatening and career-affecting eye injury during an Astros game in 1984. The Lobos won a championship again in 1996. The Capitanes won their first ever championship in 1959. After that, the Capitanes have not had much luck in their basketball tournaments, but in 2002, they started to turn things around, reaching the semifinals. However, they lost the series to the Vaqueros by losing 4 straight games, after having a 3-0 game lead in the series. The Capitanes won the National Superior Basketball championship on 2005 beating the Vaqueros of Bayamon in 4 games. This was the first championship in 46 years. In 2007 they got to the finals, losing in the overtime on the seventh game of the series against Los Cangrejos de Santurce. In 2008 Arecibo won the tournament championship again, against the Gigantes of Carolina. In 2010, they won again against Los Vaqueros of Bayamon. Arecibos main shopping mall is Plaza del Atlantico as well as the one situated in the neighboring town of Hatillo, Plaza del Norte.